Although the Western Region has a reputation for doing things their own way, the Southern must run them a close second. When Mk1s were converted to air braking the usual arrangement was for both vacuum cylinders to be replaced by smaller air cylinders in a slightly different position but using the existing rodding. However the Southern Region did their conversions completely differently drawing, no doubt, on their extensive experience with air-braked EMUs. They used a single air cylinder mounted on the centre-line of the underframe working pull rods that ran under the bogies even when Commonwealth bogies were fitted. A few photographs of vehicles were located but establishing the exact nature of what went on in the murky world of the underframe was not easy. Both the Bluebell Railway and NRM Shildon have vehicles believed currently to have this brake arrangement but I was unable to obtain permission to crawl underneath and take pictures. In the end salvation came from members of Western Thunder and the Yahoo BR Coaching Stock group, in particular Mark Brinton who kindly provided schematic drawings and answered my incessant questions, and to fellow Wealden Group member Guy Hamilton-Fletcher who helped me make sense of it all. With all this information I was able to draw up a single piece etch to represent the visible bits of the brake arrangement. The test etches used here proved to be usable, with just a few tweaks made for future batches to adjust the height and provide better mounting points. The v hangers and vacuum cylinders were removed from the Farish coach and the etch glued in place along the centre-line. The air cylinder and reservoir were turned from plastic rod in a mini drill. The reservoir is mounted on the floor but the cylinder had holes drilled in the end and simply hangs in place on the etch (the lack of a solid mounting point not being obvious in the gloom). This is set 18, a 3 coach set used on Oxted line services in 1968 made up of TSO, BSK and CK. I have modelled four coaches with the TSO being in both green and blue/grey for variety. 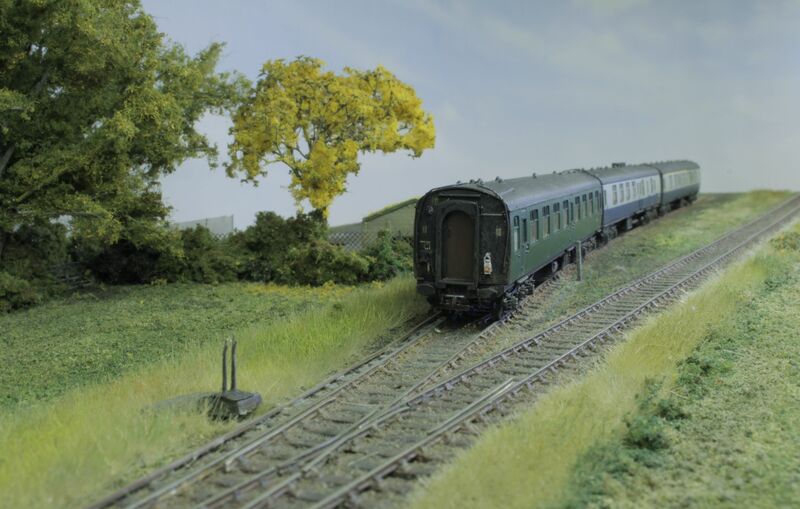 The coaches will eventually form part of an 8 coach set used on the Uckfield service - it's where the Wealden Group meet so seemed appropriate. Other work involved reducing the overscale roof ribs, restoring the periscopes on the BSK, removing top end steps, fitting in-line brake shoes, adding corridor connectors (cut out using the Graphtec cutter as per Nigel Ashton) adding warning flashes and a set number to the green TSO, adding the below-underframe end steps and vacuum hoses to the outer vehicles, renumbering, repainted roofs and a bit of weathering.